In the hours before dawn last Monday, 21 Jan, there was a total eclipse of the moon, visible from here in the south-east of the UK. The picture above is a composite of picture of that event. I’ve never tried photographing one before, so this was a bit of a seat-of-the-pants attempt, but one, I think, that worked gratifyingly well. I have the Nikon 200-400mm f/4 VRII lens which I bought primarily for photographing aircraft (and certainly not for astrophotography!). As a way of extending its reach, I used the Nikon TC-2.0III converter, making it an 800mm f/8 lens (the TC2 reduces the effective aperture by two stops). If you’ve ever read any of the reviews of the 200-400, you’ll know this is absolutely, positively not the recommended procedure. So, the day before, I set up the D810 with the 200-400 and TC2 to see how it worked. As expected, the autofocus was unreliable , and the image quality was not great at f/8 (wide open). I tried a series of different apertures, and at f/16 the image quality looked pretty good, and manual focussing seemed to work fine. Hmmm… an 800mm, f/16 lens. At 800mm, the movement of the moon in the sky is obvious even to the naked eye. There’s not much light coming from an eclipsed moon, so I wasn’t at all sure it would be possible to get any kind of image of the eclipse given the length of the shutter speed needed at f/16, even at very high ISO. The image of the full moon at the top of the composite was actually taken at about 11pm before the eclipse, as a test to see if the 200-400mm/TC2 combination was practical at all. In fact it was fine. Manual focus was also fine. 1/250sec at ISO 400 - no problem. Full moon. Nikon D810, Nikon 200-400mm f/4 at f/16, ISO 400, 1/250 sec, manual focus. Setting the alarm for 03:30, I managed a bit of sleep, before heading back out into the frosty night. I’d left the tripod/gimbal outside since set up ready to put the camera on: it was covered in thick frost. Mounting the camera on it, I started to get some nice pictures of the moon as more and more of it disappeared into the eclipse. By 05:00 I was freezing, despite being dressed as warmly as I could. I have some of those photographers gloves with the turn-back fingers, for twiddling dials. The gloves were great, but continually trying to get exposure series at different shutter speeds and ISO values, meant I was exposing the tips of thumb and forefinger - and they got seriously cold. So, I took a break to warm up and have a cup of tea during part of the totality, which seemed to go on for ever. Anyhow, warmed up a little, I went back outside to finish the series. 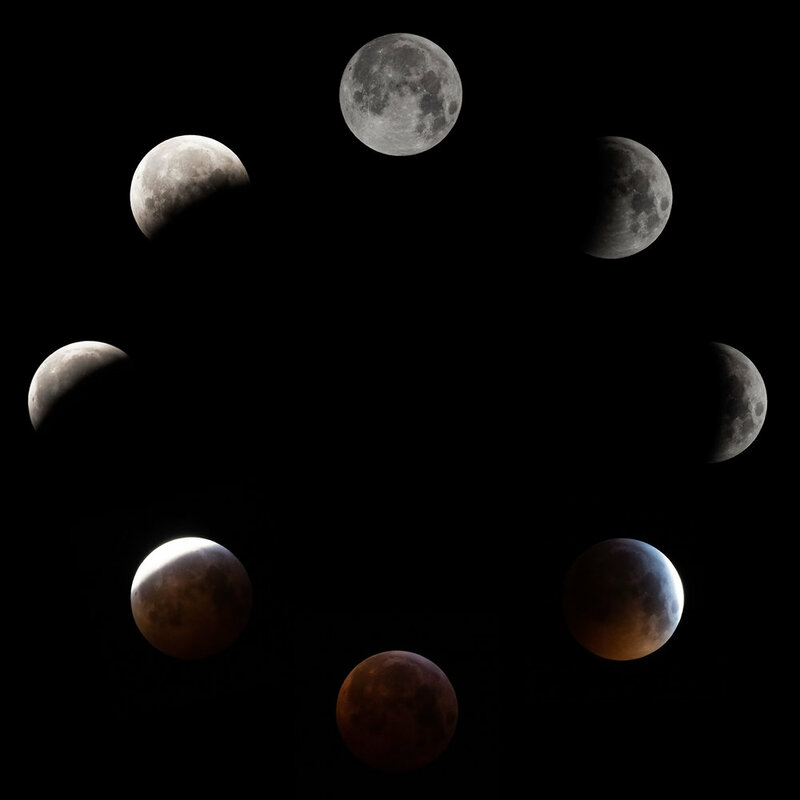 I shot a lot of different ISOs, and lots of replicates of the darkest phases of the eclipse. The full eclipse was a deep red colour, and gave an exposure of 1/5 sec at ISO 10,000. I didn’t want to try a longer exposure than that as it would have resulted in motion blur as the moon moved across the frame. The result looks pretty true to life, but under-exposed compared to what I’d like. I’d planned to use multiple replicates of the totality to combine in a median stack to reduce the noise, and hopefully get an altogether clearer image. But Photoshop refused to cooperate. It just would not auto-align the images. I’ve tried aligning them by hand, but the results are … errr … sub-optimal. Anyhow, the composite I’d envisaged beforehand worked really well, and comprises single images just processed normally through lightroom. Tags: Moon, Eclipse, "Super Blood Wolf Moon", "Nikon 200-400mm f/4 VRII ", "Nikon TC-20E III Teleconverter", "Bloody freezing", "Composite image"